Download our brand new app from the app and play store now and enjoy the benefits below. Our app booking system links directly into our dispatch system so you can track your car real time and amend your bookings. We felt our customers required a better service and a mobile solution. Whether you have an Android or Apple phone you will be able to track our drivers, your booking and have complete control of your service with us through your mobile! We know it can be frustrating waiting for your car to arrive, now you can plan your time precisely and know what the estimated time of arrival is so you can do more with your time. You can even choose your vehicle type and make special requests, and just incase you have an issues, our advisors are ready to support you with any questions you may have. 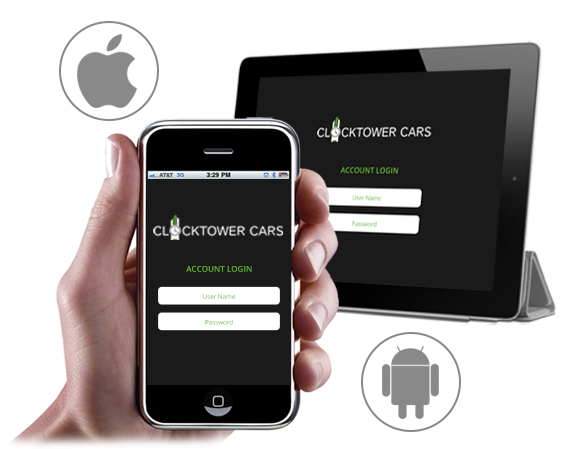 ClockTower Cars is determined to always improve on our service, For more information please fill in our enquiry form by simply clicking on the icons on the right or call us on 01372 747 747 so one of our advisors can assist you further.